An urban beach and a seaside garden have popped up along Southbank. A funfair and traditional beach huts. each of these huts has an installation inside, ranging from a seashell grotto to a penny machine that lets you whack a banker. It's going to be a grand summer. Pardon? A penny machine that lets you whack a banker! These are really cool Mo. Love them. It looks like the Southbank area has been getting a lot of attention in recent years. These little faux beach cottages will liven things up. What fun. I love the idea of an urban beach! I could have done with some of those when I was a kid growing up thousands of miles from the beach in Johannesburg. 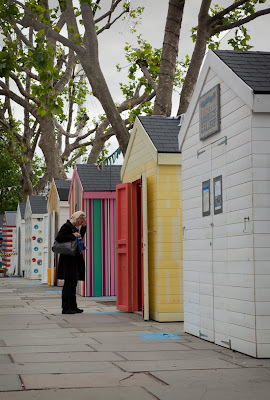 Huh... beach huts in London... hope they're still there when I get back in July. They're nearly as colourful as the famous beach huts on Brighton Beach in Melbourne! London gets the most interesting art projects! Wish I was there to explore! It seems she is praying. I hope she does. Love the bright colours of the beach houses. I am coming over in Sept - hope they are still there! I'll have to tell my Sweetheart about this, he's heading your way in July! I love beach huts. I must go and visit these! Aren't people creative - these sound like fun. I imagine 'whacking a banker' will be a popular one! Something bright in Southbank, about time! I love the idea of 'whacking a banker' for a penny. Although I suspect some bank is making money out of that! I agree Mo! It is going to be a super summer! I saw the funfair from the train but not the huts. I love Southbank and must visit. I am coming over in September, so I hope they will be there too, just like RedPat. I wish I knew about the whack a banker machine when I passed by last week and I would have emptied my wallet having some fun! Great photo. I could see those huts the other day from the bridge but didnt go down there. I'll have to have a look when Im in London in a couple of weeks (if they are still there).